If you would like to make the Barker Horn your Ringtone (crazy) here are the files. I have never added a ringtone, you will have to find what works for your device on the internet. 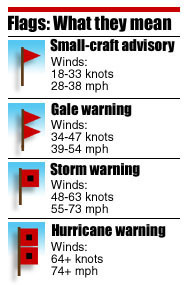 Warning-this may get peoples attention, but, not everyone is a boat nerd and may react differently! 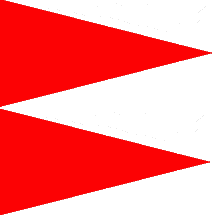 Save this Barker Horn File m4r file to your phone. James R Barker arrived Duluth this morning to load iron pellets. The Barker had been stuck in ice on the St Mary's River for a bit. This 12 day (2 min) time-lapse was taken over the past 12 days and depicts the wild beauty of a Lake Superior shipping port during December. The bright light falling from the sky at night is the moon setting. 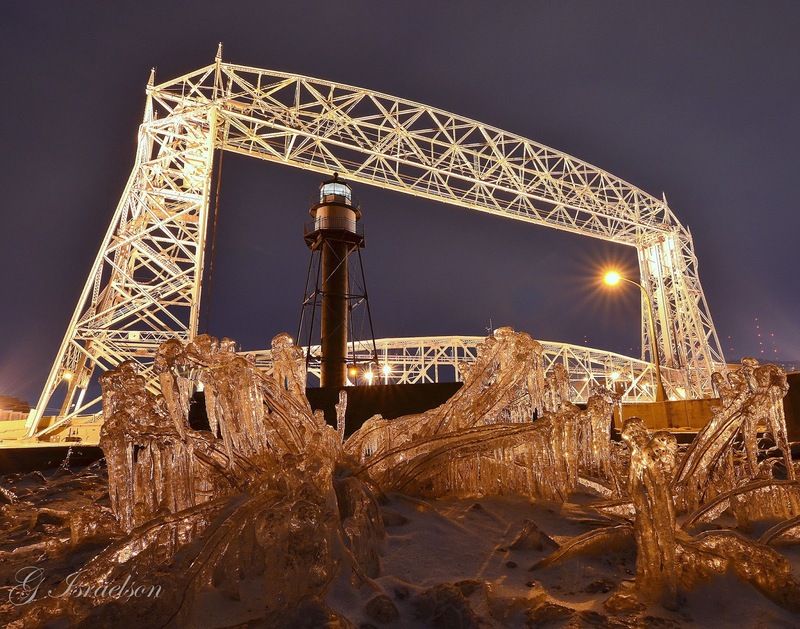 Greg Israelson captured this terrific night image of the Lift Bridge. No place better to be than a quiet -20F morning on the shore of Lake Superior. God's handiwork never ceases to amaze me. 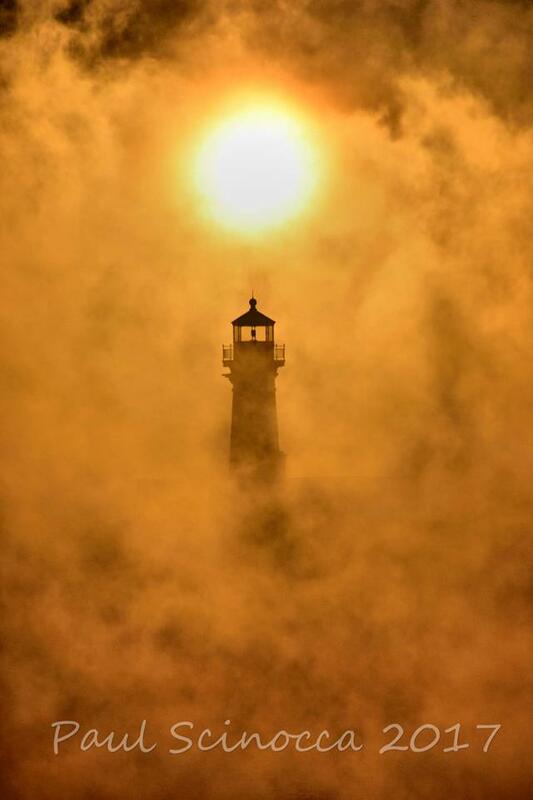 This cool photo was taken by Paul Scinocca this morning. Cason J Callaway arrived Duluth this morning. Algoma Olympic arrived Two Harbors this morning. 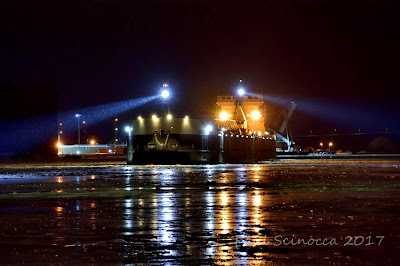 Walter J McCarthy Jr arrived Two Harbors this morning. Wishing you and your families a very Merry Christmas. Lee A Tregurtha arrived Two Harbors this morning. Edwin H Gott arrived Two Harbors Sunday evening. Edgar B Speer departed Two Harbors this afternoon. Paul Scinocca captured the great photo of the American Mariner Friday evening. Erik departed Duluth this morning with bulk cargo. 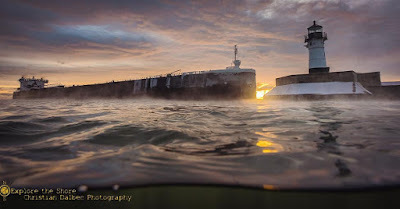 Edwin H Gott departed Two Harbors this morning. 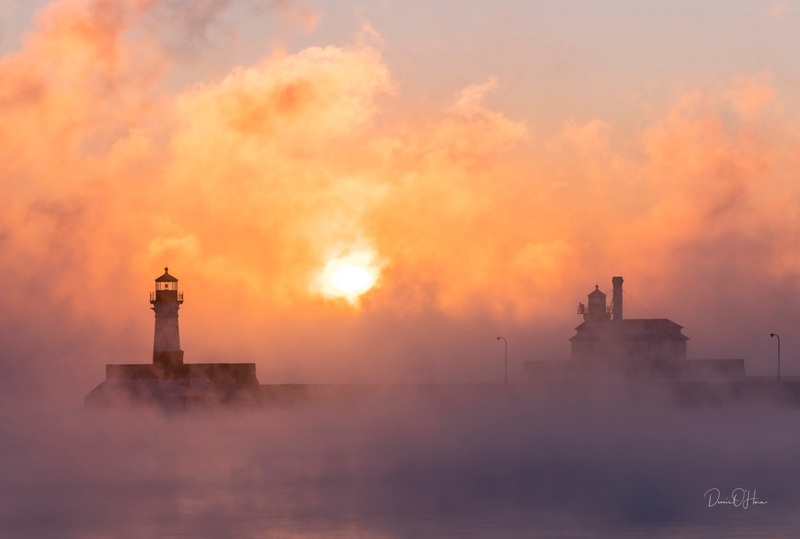 As the temperatures drop to 0F and below, the beauty of Lake Superior increases exponentially. 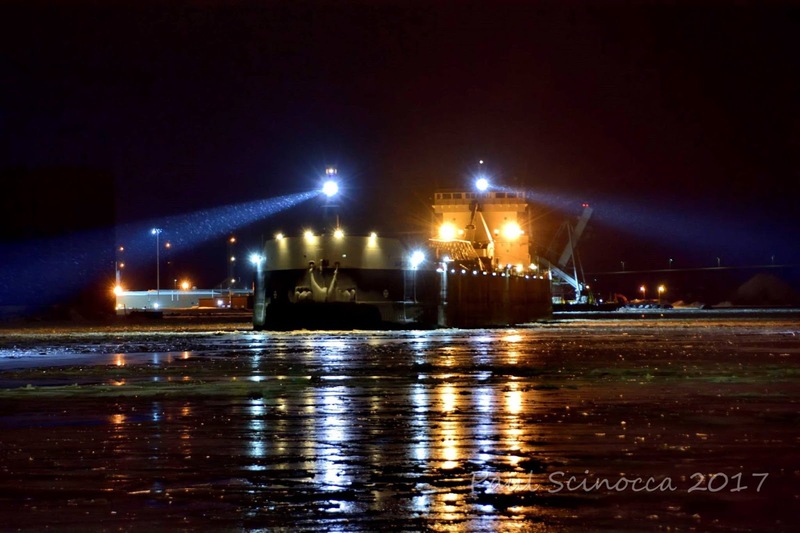 Michipicoten arrived Duluth this morning to load iron pellets. 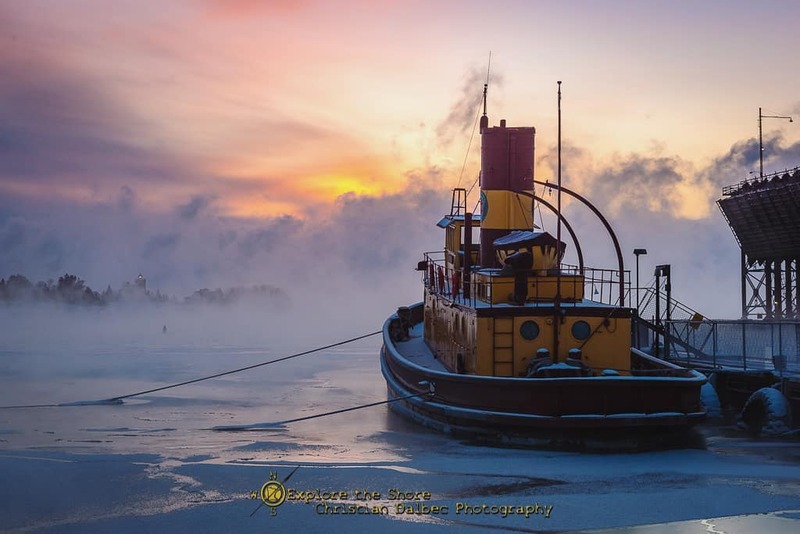 Claude A Desgagnes departed Duluth this evening loaded with grain. The moonrise tonight as it rose behind the Lift Bridge on a quiet December evening. This timelapse is composed of 650 images taken during a 90 minute period. People often ask why the Duluth Aerial Lift Bridge raises, seemingly, before it really needs to. This morning as the 1000ft Paul R Tregurtha approached the Duluth Shipping Canal, the bridge suddenly stopped raising leaving the captain of the Tregurtha no option but to make a quick decision in order to prevent a disaster. The Tregurtha did a 360 turn while the bridge completed it's lift and safely entered the harbor.